Very few people planning to wed expect that they will one day be in divorce court. However, at Lewert Law, our experienced Boca Raton prenuptial agreement lawyers know that no one can foretell the future – especially when it comes to marriage and divorce. Protecting your assets in the event of divorce is simply a wise decision in an unpredictable world – like purchasing insurance or having a will prepared. Call us today if you need a prenuptial or postnuptial agreement drafted or enforced or if you simply want or need to learn more. 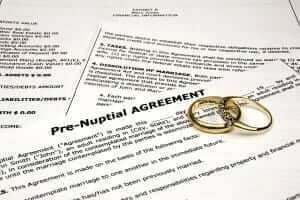 A prenuptial agreement is a legally binding contract between two individuals who are anticipating marriage. The contract sets forth what each partner’s obligations and respective rights will be during the marriage and after the marriage if the parties divorce. A prenuptial agreement can help couples avoid lengthy and costly legal battles if the marriage ends in divorce. Couples get these nuptial agreements for a few different reasons, for protection of assets in the event of divorce, to provide for the distribution of the parties’ assets in the event of the death of a party, and to define the obligations of each party during the marriage. Florida follows the theory of equitable distribution. In the event of a divorce, the court will make an “equitable” distribution of the property and assets of the marriage based on the circumstances of the parties. The nuptial agreement, for protection of assets, in the event of divorce makes sure property is distributed how the couple agreed. To provide for the distribution of the parties’ assets in the event of the death of a party is a provision that ensures both parties assets are protected in the event of one party’s death. The final nuptial, to delineate the obligations of each party during the marriage is a provision to address which party is responsible for certain expenses, if the parties must file joint federal income tax returns, etc. In Florida, parenting responsibilities and child support issues cannot be addressed in a prenuptial agreement. Postnuptial agreements are similar, legally binding contracts that cover the same issues, but these are signed after the parties are already married. It is important to keep in mind that Florida has not adopted the Uniform Premarital Agreement Act so nuptial agreements must meet certain requirements. For this reason, it is always in everyone’s best interest to seek the help of a qualified Florida family law attorney prior to drafting or signing any type of nuptial agreements. An experienced Boca Raton prenuptial agreement lawyer can help you prepare a prenuptial or postnuptial agreement and ensure that the final document is legally binding under Florida law and enforceable on both parties. DO I NEED A PRENUPTIAL OR POSTNUPTIAL AGREEMENT? Even if you believe that your marriage will never end, entering a prenuptial or postnuptial agreement is still a wise decision. Tina L. Lewert is a skilled negotiator and an accomplished trial lawyer as well as a Florida Supreme Court Certified Family Law Mediator. This unique combination gives her clients the advantages they need. At Lewert Law, we can explain your options, protect your rights, and help you take the right steps toward a brighter future. We invite you to schedule an appointment by phone at 561-220-0123 or by e-mail through this website to discuss your needs, options, and legal rights as quickly as possible. It is important that you don’t delay getting an agreement. An agreement that is signed the day before the wedding can reek of coercion. You know that’s not the case, but that may not necessarily be how a court sees it. In some cases, one spouse will try to invalidate the contract using this argument that they were forced to sign it or they didn’t know the true worth of their spouse when they signed it. On rare occasion, a prenuptial agreement can be overturned if this can be proven but not because the divorce settlement is not fair. Both parties should have their own independent counsel in order to make sure that neither party is being coerced and that there is a fair playing field for both parties entering into the agreement. Later, if a divorce is inevitable, there will be a binding contract in place that everyone agreed to. Try to sign the prenuptial agreement at least a few weeks before the wedding. Decide whether you want to get a prenuptial agreement, have the conversation with your partner, and get in touch with a Boca Raton divorce lawyer to draft the contract as quickly as possible. A month before your wedding date seems like an ideal timeframe to sign a prenuptial agreement. Remember, it’s hard to tell exactly how a court will view a prenuptial agreement. An agreement signed at the very last minute may seem like an agreement based on coercion. If a court believes that the contract was forced, it will be thrown out. For help reviewing a prenuptial agreement, speak to a Boca Raton divorce lawyer. True love knows no age limits, but the fact is that getting married after 50 is a lot different from getting married in your early 20s. For one thing, you’re probably going to be a lot more cautious about money. Older marriage partners are likely to bring some financial obligations and debts into a marriage, but they also bring abundant financial knowledge and experience that they lacked thirty years earlier. If you get married after age 50, you should seriously consider – and discuss with your spouse-to-be – having an experienced Boca Raton family law attorney draft a prenuptial agreement on your behalf. Especially if you and/or your new spouse are the parents of adult children, a “prenup” can clear the air and ensure that everyone will be treated fairly. Sure, prenuptial agreements can be an awkward topic for some engaged couples, but it should probably be less awkward for older adults. A fair agreement that has the consent of both partners and protects both partners is just good sense. For help in south Florida with prenuptial agreements and any other pre-marriage legal issues, contact an experienced Boca Raton family law attorney promptly. Kelley Ms. Lewert never lost sight of the practical realities of my divorce. Although she listened compassionately so that she understood what she needed to, she did not let me lose sight of my goals and what was acheivable within the system even when things got emotional. She protected my financial interests and my personal interests. Thanks to Ms. Lewert, I no longer have to deal with a difficult ex-. She didn't always tell me what I wanted to hear, but because of that, my case did not drag out longer than it should have. I never felt that she put her own interests ahead of mine. Her judgment was reasonable and her advice sound. She and her staff were good at dealing with difficult and unreasonable people in a professional and ethical way. Thanks to Ms. Lewert, I never got drawn into senseless battles, recovered as quickly as possible from my divorce and was able to move on and enjoy a better life. I have recommended her repeatedly to others who need an excellent family lawyer. A.C. I chose Ms. Lewert for my divorce because she is Board Certified and only practices family law. I did not want someone who dabbles in family law along with many other types of law because my divorce involved a lot of different issues and I wanted someone who knew every nuance of family law so I could be sure I was getting the best representation. Ms. Lewert was always there to explain the law and to guide me as to all of my options and possible outcomes. She always went out of her way to keep me informed of any issues arising in my case and answered all of my questions, even after business hours. For a Board Certified attorney her rates were extremely reasonable. I would not hesitate to recommend Ms. Lewert and her firm to anyone who needs a top-notch family lawyer. D.C. Ms. Lewert handled my divorce for me. I initially contacted her because she specializes in divorce and family law. After I met with her I knew that I wanted her to represent me. She was very smart and and self-assured and was able to answer all my questions and explain the divorce process to me. Ms. Lewert was always very prepared whenever we had to go to court and made sure that I was prepared as well. She was confident and aggressive in court, which was important to me because I wanted an attorney who was not afraid to go to court and fight for me. I was able to contact Ms. Lewert whenever I had questions or just needed some reassurance (which was often!) and she always responded to me right away and even texted and emailed me on the weekends and after hours. Her staff was always very helpful and supportive as well and made sure that I was informed of everything that was going on in my case. I would highly recommend Ms. Lewert to anyone who needs a divorce attorney. Copyright © 2019 by Lewert Law, LLC - All Rights Reserved.